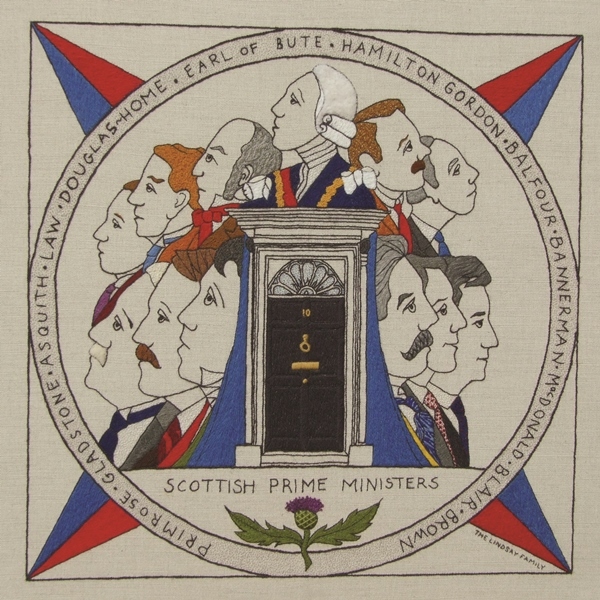 Since the Jacobite Rising of 1745 no fewer than ten Scots, seven actually born in Scotland, have held office as Prime Minister. The first was the Earl of Bute (1762), followed by the Earl of Aberdeen, Earl of Roseberry, Arthur Balfour, Henry Campbell-Bannerman, Andrew Bonar Law, Ramsay MacDonald, Alec Douglas-Home, Tony Blair, and then Gordon Brown in 2007. Such disproportionate representation at Westminster (compared with Wales, Ireland and England) clearly reflects a determination to ensure Scotland played a leading role in the Union and Empire. William Gladstone and Herbert Asquith also sat for Scottish constituencies whilst holding office at 10 Downing Street. Bho àm Ar-a-Mach nan Seumasach ann an 1745, chan eil nas lugha na deichnear Albannach le seachd dhiubh air am breith ann an Alba, air dreuchd a’ Phrìomh Mhinisteir a ghleidheadh. B’ e Iarla Bhòid (1762) a’ chiad fhear dhiubh air a leantainn le Iarla Obar Dheathain, Iarla Roseberry, Artair Balfour, Eanraig Caimbeul-Mac Ille na Brataich, Anndra Bonar Law, Ramsay MacDhòmhnaill, Ailig Dùbhghlas-Home, Tònaidh Blair, agus an uair sin Gòrdan MacIlleDhuinn ann an 2007. Tha a leithid sin de riochdachadh mìchuimseach ann an Westminster (ann an coimeas ris a’ Chuimrigh, Èirinn agus Sasainn) a’ nochdadh gu soilleir dealas a thaobh a dhèanamh cinnteach gum biodh a h-àite fhèin aig Alba aig toiseach gnothaich anns an Aonadh agus Ìmpireachd. Shuidh Uilleam Gladstone agus Herbert Asquith cuideachd airson roinneantaghaidh ann an Alba fhad ’s a bha dreuchd aca aig 10 Sràid Downing.